There are a lot of popular project management tools out there, but nothing comes close to the sheer legendary status of Basecamp. Unfortunately, Basecamp has no good time tracking abilities of its own. This is why we’re here to discuss how you can get good time tracking for Basecamp. One of the major factors that has allowed Basecamp to prosper is its flexibility and adaptability, It was built to work with other apps and services, be it through official add-ons or third-party solutions. Nowadays there is rarely a time-tracker that doesn’t offer integration with Basecamp. Not all solutions are made equal however, so we decided to review only the best ones for you. Another great time tracking service that offers seamless integration with Basecamp. 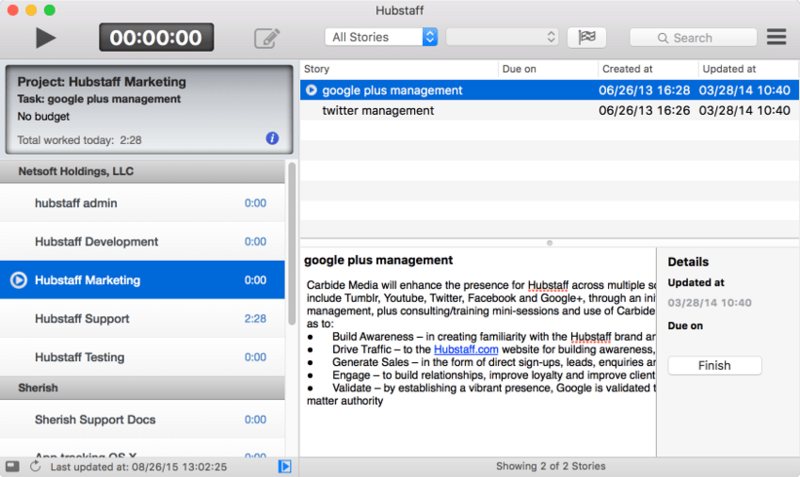 Perhaps one of the best things about Hubstaff is that its designed for effortless use. It comes with a bundle of useful features and a host of integrations. Hubstaff supports and has developed a native client for Windows, Mac OS and Linux. The client is exceptionally lightweight and accessible to anyone. One of the coolest feature it has is the ability to supervise in real time. It lets you see who’s currently online and what they’re working on. Furthermore you can manually set how often it takes screenshots. It even enables users (both managers and employees) to manually enter time, if they did it offline. Of course as a manager you can turn this feature on or off as you please. This service measures the activity of each user by counting keystrokes per minute and analyzing mouse movements. It then displays this activity in the form of activity bars, and this allows for a clear insight into the user’s productivity habits. Integration is really straightforward with Hubstaff. It integrates with Basecamp effortlessly and perfectly. All items from your Basecamp To Do lists can be tracked as tasks via the Hubstaff desktop client. Time Doctor is a very simple time tracking app. Its integration with Basecamp is just as straightforward. This app takes the to-do list items from Basecamp and synchronizes them to its own service. Time Doctor is extremely user friendly due to the neatly designed user interface. The excellent dashboard makes time tracking undemanding and quite pleasant. The software’s simple UI guides the user through the process of time tracking using leading questions. It was intended to provide methodical time tracking. It features big green “GO” buttons for starting timer and smaller conveniently colored orange “break” buttons for pausing time tracking for a given activity. Screenshots, which are taken every few minutes, are displayed on the “Screenshots” tab. Other activity info, such as keystrokes and mouse movements per minute are also displayed. Time Doctor also has the ability to show you how much time each user spends using apps or visiting web sites. See the differences between Time Doctor and Hubstaff. Worksnaps is quite simple and easy to use. However it is notable that some questionable design decisions have been made throughout the development process. It comes with all the standard features you’d expect from a time tracking software. This includes things such as random screenshots along with activity tracking via mouse movement and keystrokes per minute tracking. It offers a 30 day trial so that users can test drive the software. Worksnaps offers what it calls two-way integration with project management services such as Basecamp. It imports tasks or To Do items and then lets users log time to these imported taks. Then it synchronises the logged time to Basecamp and displays it there as well. There are four pricing plans which cover a wide range of team sizes, varying from 4 to 30 employees per team. The cheapest option stands at $20 for 4 users, and the most expensive is at $90 for 30 users. Above this user threshold employers pay a fixed fee per each additional user. This time tracking service describes itself as “Insanely simple time tracking”. And they just might be right. Toggl can be used via its web service or the desktop native client. If used via the web app it really is “insanely easy”. There is no installation and you just select your task and click start. But in order for this “insanity” to exist you first have to link it to your Basecamp account. The setting up part is quite simple as well. Once set up, Toggl can track time via the mentioned web app as well as via a native desktop client. Toggl offers desktop clients for Windows, Mac OS and Linux. Furthermore, apps have also been developed for iOS and Android. There is no screenshot feature being offered though. Instead, Toggl takes notice of what program is used and for how long it is being used, thus tracking what the user is doing in a descriptive manner. Simplicity comes at a price, and perhaps Toggl is better off without some features. It all comes down to personal preference. You have to see which feature set suits you best, and then compare it to the user interface. You might find that you love a time tracking service, but be disappointed by its integration with Basecamp. As it turns out, we here at Hubstaff have worked really hard to impress you on both ends. Hubstaff is slowly becoming one of the most popular time-trackers for its elegant simplicity, one that hides a lot of advanced features. At the same time we work really hard to allow for seamless integration with your favorite services. To check out a Hubstaff powered Basecamp experience, just take the first step. Start your free trial right here. Thank to our elegant, lightweight process, you’ll be all set up within minutes. Then be sure to proceed to this page about setting our time tracker for Basecamp.